The original owners wanted a U.K.-style pub. English, Irish, Scottish — it didn’t matter hugely, they just wanted the kind of pub that they enjoyed so much on their trips abroad. They wanted the music to be rock, mostly English rock, and loud enough so that you can name the song; but never so loud that you need to shout over the song. They wanted the food to be both comfortable and spectacular, a mix of mid-range pricing and fine-dining quality. And they wanted the finest draught beers from the U.K. They wanted a place you can hang about and chat; where everyone feels welcome and comfortable. They wanted a place where you can watch international football (soccer); or maybe instead have a go at the dartboards. Now there's a new owner: an actual Brit. And what first attracted him to Fleet Street was the fact that the previous owners got it so right. He's adding a few things: a comfy sofa or two, and a few books and board games to help you while away an hour or two; and he's stocked the bar with a good selection of Scotch Whisky. 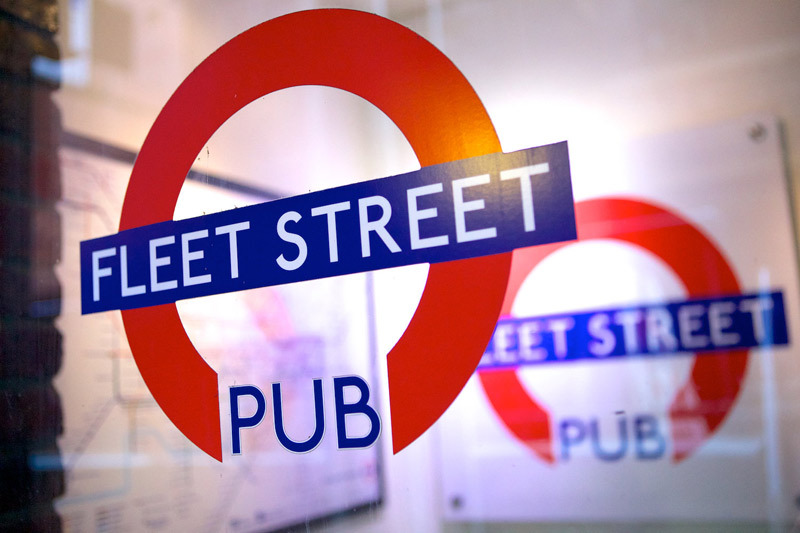 But if you've been to Fleet Street before, you won't find any major changes. And if you've not visited us yet... come on by! We'd love to meet you. We make all of our food here. From sausages to sauces; from batter to fries; whatever you're eating, it's been made in-house. We do not serve manufactured or bought-in products, we buy ingredients and cook real food. We hope the pride we take in our food shows, and that you're as happy with it as we are. We have 14 beers on draught. 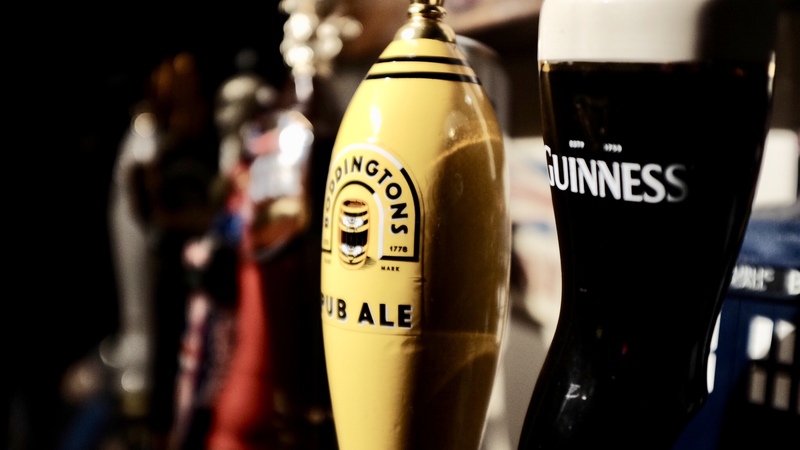 Many are British, including Fullers ESB and London Pride, Iron Maiden Trooper, and Boddingtons. We also have local beers on draft, including (of course) at least one IPA at any time. To supplement the draft selection, we have a wide range of British, European, and domestic bottles and cans. London's Fleet Street was the home of newspaper publishing from about 1500, and the first daily newspaper was published there in 1702. Fleet Street soon became synonymous with the news media in the same way that Wall Street became synonymous with the financial industry in the USA. 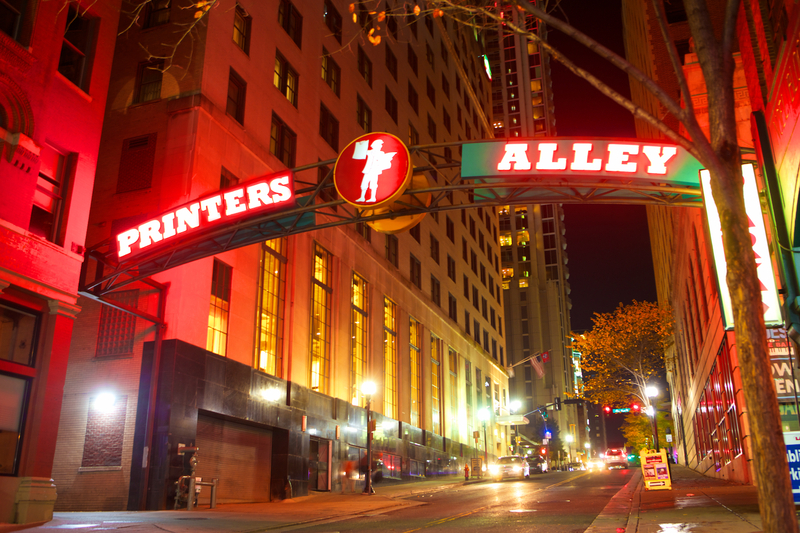 Meanwhile in Nashville, the pub is on Printers Alley, which is so named because it was the hub of the publishing industry in the southeast, and where Nashville's first newspaper was published. 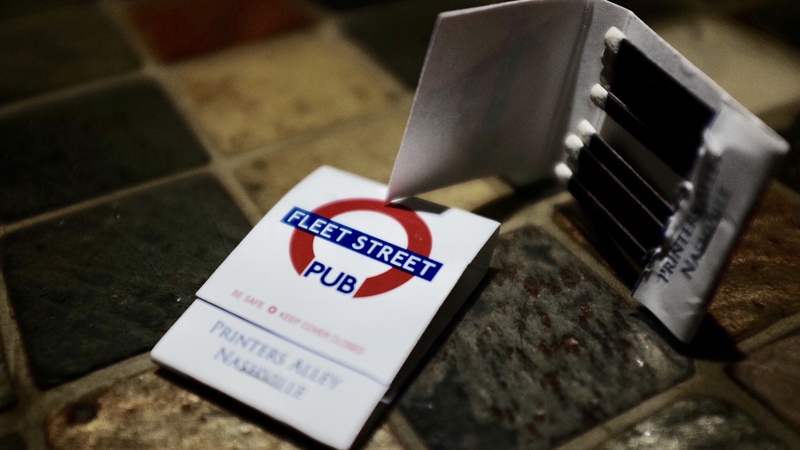 Thus an English pub on Printers Alley naturally became Fleet Street Pub. And since the location was downstairs and in a basement, it seemed almost too obvious to go with a London Underground theme. A lovely IPA with a fruity, hoppy flavor. A Local favorite. Creamy, rich, light-golden pub ale from the North parts of England. An amazing beer. Sweet, fruity, Flanders red ale. Smooth and creamy with hints of chocolate and coffee. A smooth, complex beer with a malty base and light hops. A classic. Guinness is good for you! A fairly light, very easy-drinking lager. An ESB-style deep golden ale with a subtle hint of lemon. And metal! A delicate yet complex blend of flavors which delight the palate with... ah, c’mon. It’s Miller Lite. Classic British cider, though slightly sweeter than the version found in the UK. A tasty, Belgian-inspired wheat beer from a local brewery. A delicious, naturally cloudy Bavarian-style lager. A ‘gateway whisky’ for those without the palette for a heavily smoky drink. Hints of cinnamon, apple, and pear are rounded out with a subtle touch of smoke. A mix of 80% peated, 20% unpeated malt, you’ll taste some charred, smoky notes but nothing too overpowering. A lovely whisky. Orchard fruits, and a hint of almonds at the finish. Spiced and rich, this whisky is finished for 18 months in Red Burgundy casks, giving it a delicious extra complexity. A big, crisp, dry and very aromatic nose, and a medium-bodied slightly smoky body, won this beauty 95 points from Whisky Bible. A very approachable Scotch for those who are new to whisky. Notes of sherry and citrus, finishing with candied fruits. Aged in sherry casks, the taste is surprisingly thick and fruity compared to its more delicate nose. One of the smokiest of the Isla whiskies, this is not for the faint-of-heart… but it rewards the more experienced Scotch drinker with a terrific, thick, rich flavor. Aged in sherry casks, The Balvenie provides a fruitcake-like flavor, complemented by hints of oak. A really wonderful drink. Only one in ten thousand casks make the grade. Rich and slightly smoky, this blend is a legend. OK, this one isn't actually a Scotch. Instead, it's one of the first American single malts. Smooth, mellow, and well worth trying. Fantastic food, all prepared from scratch right here in our kitchen. Seven pepper-spiced chicken wings. Served with English farmhouse dipping sauce. Simple. Classic. Beloved. Bacon on white, buttered bread. A platter of savory deviled eggs with crispy greens and tomato salad. Iceberg lettuce wedges, cucumber, cherry tomatoes, and walnuts, with a bacon and stilton dressing. A cup of potato soup or beef stew, along with a portion of our Covent Garden Salad, White City Wedge Salad, or Barbican Beet Salad. Battered Atlantic cod, fries, our famous tartar sauce, and mushy peas (or another side if you'd prefer). Environmentally sustainable Alaskan Pollock, fries, our famous tartar sauce, and mushy peas (or another side if you'd refer). Not quite as hungry? Try a smaller portion of our Fish & Chips, without the side dish. Hand-made, jumbo all-beef burger, with fresh lettuce, tomato, onions, and roasted garlic aioli on a toasted bun. Served with a side of Blackfriars Fries. Juicy, house-ground lamb burger with Moroccan spice, harissa sauce, sweet pickled red onion, fresh mint, and cucumber on a toasted bun. Served with a side of Blackfriars Fries. Two lamb sliders, served with tahini sauce, onions, and a cucumber-tomato salad and a wedge of gratin potatoes. Soft-boiled egg in sausage and breading; crispy greens, tomato salad, and sherry-bacon vinaigrette. English bangers, mashed potatoes, rosemary gravy, thyme-roasted onions, and malt butter-sautéed Brussels sprouts. Pulled roasted chicken in a creamy pie filling with a scratch-made pie crust, tomato salad, mashed potatoes, and rosemary gravy. Minced lamb stew with mixed vegetables, topped with mashed potatoes and cheese. Our Scottish curry: fresh vegetables in a fragrant curry sauce with jasmine rice. Choose mild, medium, hot, or extra hot. Can be vegan on request. Includes a soft drink. A soup-and-salad combo: choose from our homemade potato soup or mini beef stew, plus one of our house salads — garden salad, wedge salad, or two-beet salad. Also choose one of roasted shallot vinaigrette, lemon-ginger vinaigrette, or creamy bacon-stilton dressing. Includes a soft drink. A lamb slider, served with a small portion of our famous potatoes au gratin and a garden salad. Includes a soft drink. A lunch-sized portion of our Royal Oak Fish & Chips entree. A generously-sized portion of Alaskan Pollock, fried in our famous batter, along with hand-cut chips and our amazing homemade tartar sauce. Includes a soft drink. Questions? Comments? Suggestions? Email info@fleetstreetpub.com and we'll get back to you as soon as possible. Sunday to Thursday: 11am to 1am. Kitchen open until midnight. Friday and Saturday: 11am to 2am. Kitchen open until 1am. We allow smoking from 3pm each day, though we have ‘smoke-eaters’ installed which means you shouldn't notice the smoke even late in the evening!